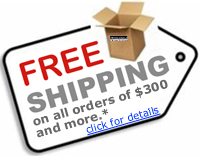 For a multiple product order, we will make every attempt to ship all products contained in the order at the same time. We will notify you either via email or phone if an item is unavailable. If an item is out of stock we will attempt to contact you. If we are unable to contact you within one business day we will ship the items that are in stock and adjust your invoice according to what was shipped.